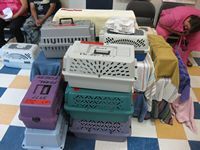 Today, Feral Fixers had 23 more cats (14 ferals and 9 'friendly' ferals) fixed at the PAWS Chicago Spay/Neuter clinic. One of our super-volunteers, Sue, loaned us her van so that I could bring them down in one load in the morning and pick them up in the afternoon. Thanks Sue! PAWS is normally closed on Friday, but because they were going to be closed the following Saturday and Sunday, they opened the clinic on Friday. As anyone who has been to PAWS can tell you, it is ALWAYS packed in the morning, especially on weekends. It literally is standing-room only, complete with barking dogs, meowing cats and talking owners. It's a real zoo and sometimes the noise and crowds do get to me. But today was wonderfully quiet. There were only about 10 customers there - it was so quiet that I thought I was in a vet's office! I know a day like this is not good for PAWS numbers as they have to process as many animals as they can, but for those of us customers (and front desk workers) the calm was very nice indeed... This also allowed the vets to finish early so I was able to come at 4:00pm and pick up our cats (they were ready at 3:30 but I just couldn't get down there any earlier). All in all, a very civilized way to handle 23 more cats. With these cats, Feral Fixers has now processed 48 cats for the month, 564 for the year and 1,175 since our inception. We are easily going to break the 600 mark this year and 700 is now beginning to look possible. If you want to help us continue our efforts, please consider donating to Feral Fixers. Just click on the Donate button at the top of our website or you can buy something (by clicking on the Buy Something! button also at the top of our website) from our CafePress store. Even with the enormously discounted rate that PAWS offers for Feral Cats, it still takes money to buy their package for each cat, purchase the microchips, pay for transportation and pay for our supplies. All donations, no matter how small, are gratefully accepted. Thank you!